Stoves from France is a website with information about antique, enamelled stoves and cookers from France. It`s base is formed by Antonie`s stove museum in Rimondeix, France. We sometimes sell a limited number of stoves, -also through this site-, in order to develop the display. The collection contains stoves from reputed factories such as Godin, Rosières, Deville, Faure and Chappée. Each to be found on a seperate page with linkage to their proper websites. Our website contains the history of these factories and their stoves. There is also a survey to be found of our supply of stoves. 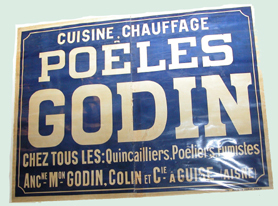 Godin has it`s own museum. Click the illustration to the right to get an impression of the stoves and cookers present. At the page `Tips` you will find advice on cleaning and maintaining your stove ,e.g. Our assortment of stoves is to be found on the page `Stoves`. Send us an e-mail, or fill out our web`s form, if you are interested in one of the stoves.